This 1935 woodcut “North Bank of the Chicago River,” by Charles Turzak, is one of the Federal Art Project holdings housed at Krannert Art Museum. It and three other Turzak prints will be part of an exhibition, “Enough to Live On: Art from the WPA,” opening Jan. 26 at the museum. 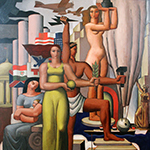 CHAMPAIGN, Ill. — Thousands of American artists created works that captured the state of the nation in the 1930s and early 1940s, portraying agrarian and industrial scenes, workers, class struggles and patriotic themes. Created through the Works Progress Administration Federal Art Project, the works were allocated to universities, libraries and museums when the project ended. Krannert Art Museum will display some of the hundreds of WPA works it houses in an exhibition, “Enough to Live On: Art from the WPA,” opening Jan. 26. It is one of several spring exhibitions opening then. The others include artwork related to the history of land-grant universities and light sculpture. The museum will open all exhibitions with a public opening night reception beginning at 6 p.m. The Federal Art Project included printmakers, painters, muralists and sculptors, as well as art teachers. The artists were given broad themes for their work – regionalism, which included agrarian scenes and portrayals of Midwestern life; and social realism, which included depictions of class consciousness and of working life and nightlife. The art was representational and different stylistically from the abstract art movement that had been popular in Europe and was beginning to migrate to America. The artworks often were displayed in federal, state and municipal buildings, libraries, hospitals and public schools. They were meant for the average person, said Kathryn Koca Polite, the assistant curator at Krannert Art Museum. “Anyone could go up to one of the works and understand it and appreciate it,” she said. Holger Cahill, the director of the Federal Art Project, “requested artists to depict the hopes and the dreams of the average person, but also the realities of a broken nation. He wanted art for everyone,” Koca Polite said. The exhibition includes a mural painting by Edwin Boyd Johnson that was recently restored to address several holes and tears in the canvas, paint loss and its need of cleaning. 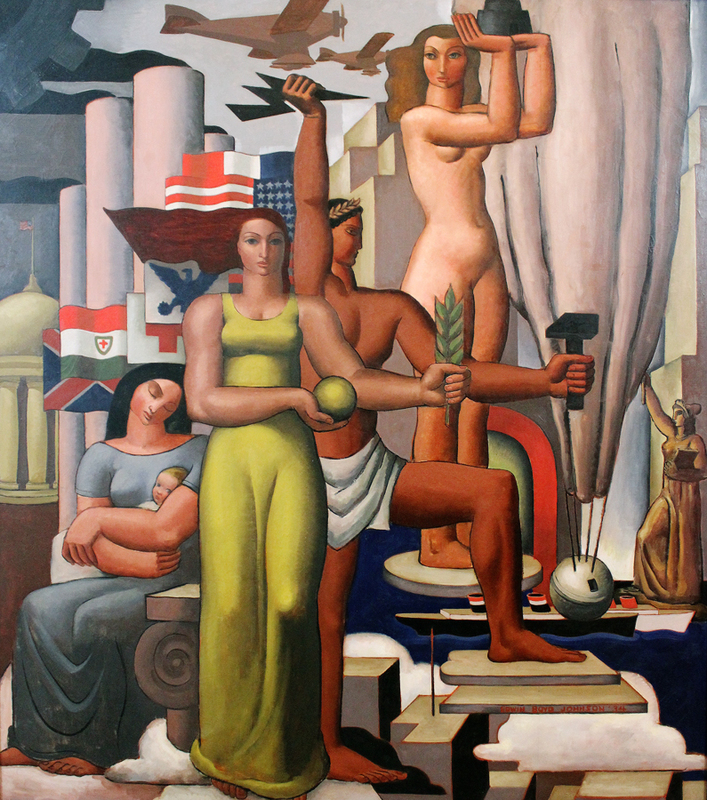 Now able to be shown after being in storage for many years, the painting has a blocky, angular, art deco look to it, with many figures and symbols intended to instill a sense of national pride. 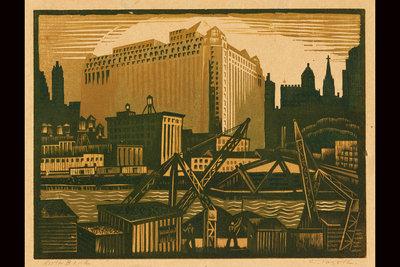 Several woodblock prints by Illinois artist Charles Turzak that depict scenes of Chicago are included in the exhibition. The four prints on view show Oak Street Beach, Lincoln Park, a view from the north bank of the Chicago River and an industrial scene south of the Loop. The exhibition also includes two lithographs by graphic artist Ida Abelman. “Wonders of Our Time” shows a group of gaunt figures beneath the Brooklyn Bridge. “You get this sense of despair. Where are they going to get their next meal? How are they going to live?” Koca Polite said, noting that Abelman’s work keenly brings home the issues of the era. “Land Grant” also opens Jan. 26 at KAM. The exhibition arose out of an art and design seminar on curatorial methods, led by Terri Weissmann, an art history professor, and Amy L. Powell, Krannert Art Museum’s curator for modern and contemporary art. It marks the sesquicentennial of the University of Illinois by examining the history of its founding as a land grant university, land use practices, questions of indigenousness and the status of public higher education. The exhibition was organized by students, and it includes photos, paintings, documents, newspaper accounts and experimental projects from the collections of Krannert Art Museum, the Rare Book and Manuscript Library, the University Archives and other sources. 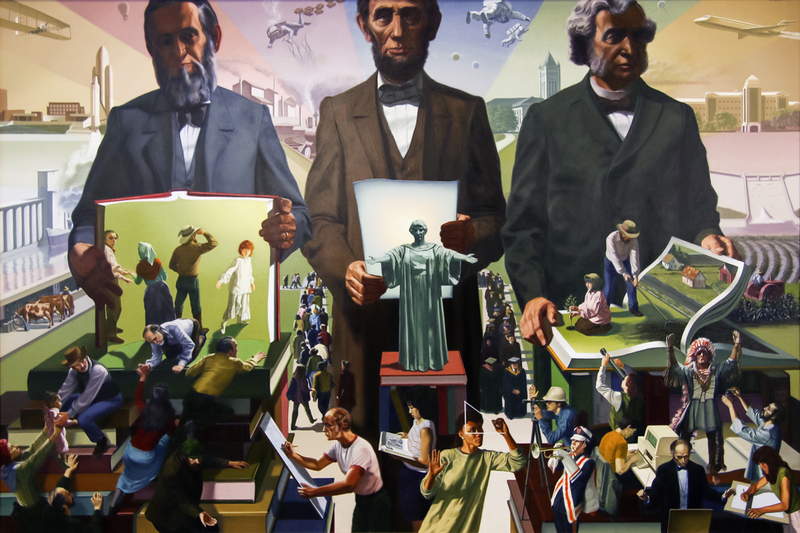 One of the central objects in the exhibition is a painting by Billy Morrow Jackson, “We the People: The Land Grant College Heritage,” that was commissioned by the U. of I. for the president’s office. 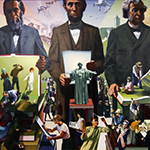 The painting features portraits of Abraham Lincoln, Justin Morrill and Jonathan Baldwin Turner, all of whom were instrumental in creating and passing the Morrill Act establishing land-grant colleges. “It shows the history of the university, but it’s only one portrayal of that history,” Powell said. Students found documents, images and artworks that support the painting’s vision of a free and democratic education for all, and others that share similar goals but demonstrate alternative models of education, she said, such as the “Whole University Catalog,” an effort by electrical engineering professor Heinz von Foerster with his students in 1969. Also on display is a concrete canoe painted in the pattern of a corn cob – titled “Corn-Crete” – from the Boneyard Yacht Club and the department of civil and environmental engineering, an artifact from the Inter-Collegiate Concrete Canoe Races that began in 1971. They looked at objects examining the histories of indigenous people with the land that was given over to public education. One such object is a Bible printed in the Cherokee language, from the Rare Book and Manuscript Library. It is unbound, its pages loose, meaning it was never used, Powell said. “It becomes this obstinate object of refusal,” she said. The Jan. 26 opening at the museum also includes a small exhibition of light and kinetic sculpture and optical illusion, titled “Light and Movement in Sculpture,” curated by Powell and including the research of doctoral candidate in art history Hayan Kim. The featured sculptures are from the 1960s and 1970s, and many were created by artist-engineers. 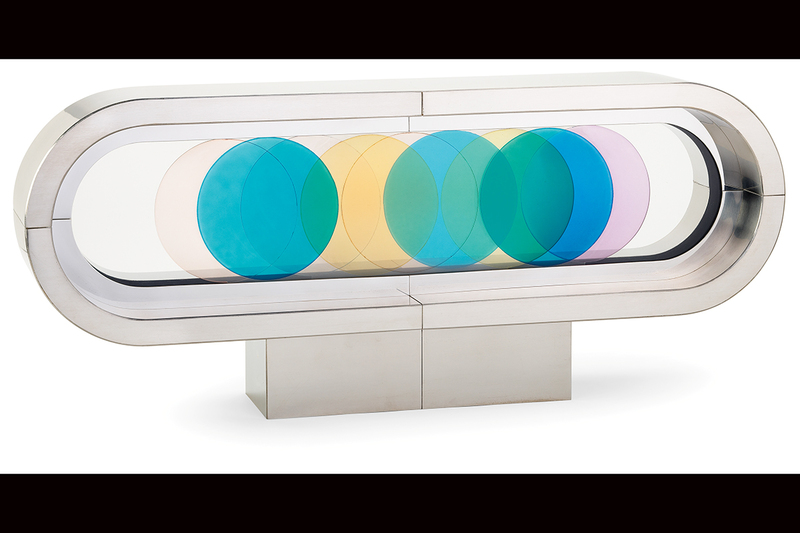 The time period was one of much collaboration between art and science, and the pieces show the future-oriented perspectives of their makers, often with a strong machinist impulse, Powell said. 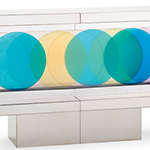 One sculpture, “Lumia,” created by mechanical engineer Earl Reiback, consists of a light box with a motor turning a series of colorful prisms. “(Reiback) saw himself as a choreographer and sculptor of light,” Powell said, adding that “Lumia” has a visual effect that has been compared to the aurora borealis. Placing these works from the permanent collection in a gallery that experiences shifting light – the Kinkead Gallery near the Sixth Street entrance of the museum – gives the work an added dimension, especially the works that reflect light, Powell said. In addition to Reiback, featured artists include Fletcher Benton, Chryssa, Max Finkelstein, Richard Hunt, Josef Levi and James Libero Prestini. Editor’s note: For more information about the exhibitions, contact Julia Nucci Kelly at jkell@illinois.edu.